Tour the Christmas exhibition and find pout about the artists featured. 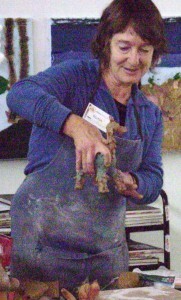 Meredith Plain, ceramic sculptor and Bolin Bolin Gallery manager and a participating artist in the Christmas at Bulleen 2015 Exhibition will be worksing in the Bolin Bolin Gallery on 2 Saturdays before Christmas. Come along and watch her at work. 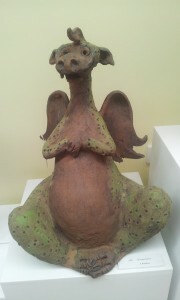 See how she makes her dragons, frogs, figures and other creatures. More about Meredith. The gallery exhibition has a wide range of work from a lot of different local artists. More about the exhibition. Meredith will be able to show you around the exhibition and tell you about the other artists and their work, as well as the examples of her own work.